All Cisco Catalyst 3650 Series Switches have fixed, built-in uplink ports and ship with one power supply. Tables 1 through 5 provide further details. Figure 1 is an image of the Cisco Catalyst 3650 Series Switches. Table 1 shows the Cisco Catalyst 3650 Series configurations. The SFP+ interface supports both 10 Gigabit Ethernet and Gigabit Ethernet ports. Refer to Table 1 for a description of the basic switch models and the corresponding uplink ports. Refer to Table 2 for a description of the various uplink port interface options. The Cisco Catalyst 3650 Series Switches support dual redundant power supplies (see Figure 2). The switch ships with one power supply by default, and the second power supply can be purchased at the time of ordering the switch or at a later time. If only one power supply is installed, it should always be in power supply bay 1. The switch also ships with three field-replaceable fans. Table 3 shows the different power supplies available in these switches and available PoE power. Table 6 shows the power supply requirements for Cisco UPOE. Cisco Multigigabit Ethernet is a unique innovation to the new Cisco Catalyst Ethernet access switches. With the enormous growth of 802.11ac and new wireless applications, wireless devices are promoting the demand for more network bandwidth. This creates a need for a technology that supports speeds higher than 1 Gbps on all cabling infrastructure. Cisco multigigabit technology allows you to achieve bandwidth speeds from 1 Gbps through 10 Gbps over traditional Category 5e (Cat 5e) cabling or above. In addition, the multigigabit ports on select Cisco Catalyst switches support Cisco UPOE, which is increasingly important for next-generation workspaces and Internet of Things (IoT) ecosystems. Many small branches and satellite offices where there are few employees do not have larger wiring closets because of space constraints. A typical office like this has smaller cabinets and would need a switch that can serve few employees, provide PoE support, can manage wired-wireless networks, and applies the same consistent policies as a bigger branch or office. Because of its less than 12” depth, lower noise, and support for 10G uplinks along with stacking, advanced security, and wired-wireless convergence, the 3650 mini is the perfect switch for this type of space. The 3650 mini switch extends access to labs, classrooms, and other training rooms from the central/floor distribution rooms, reducing cost of cabling and providing superior quality of service with enhanced security, wired-wireless convergence, and enterprise network features. Because of its shallow depth and lower noise, these switches are ideally suited for classrooms or confined areas. A typical retail outlet needs to serve customers at multiple sales points, each with a POS machine, access points, phone, printer, video display with network, and some PoE powering. These retail outlets connect to the access router that connects them to the outside network and typically need switches that fit in shallow depth cabinets. Because of the 12” depth of these switches along with advanced security and networking features, they can help retailers efficiently utilize space and save on real estate cost. The 3650 switch has advanced wired plus wireless QoS capabilities. It uses the Cisco modular QoS command line interface (MQC). The switch manages wireless bandwidth using unprecedented hierarchical bandwidth management starting at the per-access-point level and drilling further down to per-radio, per-service set identification (SSID), and per-user levels. This helps manage and prioritize available bandwidth between various radios and various SSIDs (enterprise, guest, and so on) within each radio on a percentage basis. The switch is also capable of automatically allocating equal bandwidth among the connected users within a given SSID. This makes sure that all users within a given SSID get a fair share of the available bandwidth while being connected to the network. The UADP ASIC enables the hierarchical bandwidth management and fair sharing of bandwidth, thereby providing hardware-based QoS for optimized performance at line-rate traffic. In addition to these capabilities, the switch is able to do class of service (CoS) or differentiated services code point (DSCP) based queuing, policing, shaping, and marking of wired plus wireless traffic. This enables users to create common policies that can be used across wired plus wireless traffic. The 3650 also supports downloadable policy names from the Cisco Identity Services Engine (ISE) when a user successfully authenticates to the network using the ISE. The Cisco Catalyst 3650 provides a rich set of security features for wired plus wireless users. Features such as IEEE 802.1x, Dynamic Host Configuration Protocol (DHCP) snooping, IP Source Guard and control plane protection, wireless intrusion prevention systems (WIPSs), and so on enable protection against unauthorized users and attackers. With a variety of wired plus wireless users connecting to the network, the switch supports session-aware networking, in which each device connected to the network is identified as one session, and unique access control lists (ACLs) and/or QoS policies can be defined and applied using the ISE for each of these sessions, providing better control on the devices connecting to the network. The heart of the Cisco Catalyst 3650 is the UADP ASIC with programmability for future features and intelligence with investment protection. The new ASIC provides the foundation for converged APIs across wired and wireless, Cisco Open Network Environment, software-defined networking (SDN) readiness and OnePK SDK through software updates over the product lifetime. ● Cisco Smart Install is a transparent plug-and-play technology to configure the Cisco IOS Software image and switch configuration without user intervention. Smart Install utilizes dynamic IP address allocation and the assistance of other switches to facilitate installation, providing transparent network plug and play. ● Cisco Auto Smartports provide automatic configuration as devices connect to the switch port, allowing auto‑detection and plug and play of the device onto the network. ● Cisco Smart Troubleshooting is an extensive array of debug diagnostic commands and system health checks within the switch, including Generic Online Diagnostics (GOLD) and Onboard Failure Logging (OBFL). ● Embedded Event Manager (EEM) is a powerful and flexible feature that provides real-time network event detection and onboard automation. Using EEM, customers can adapt the behavior of their network devices to align with their business needs. This feature requires the IP Base feature set. ◦ IP service-level agreements (SLAs) enable customers to assure new business-critical IP applications, as well as IP services that utilize data, voice, and video, in an IP network. This feature requires the IP Services feature set. ◦ DHCP autoconfiguration of multiple switches through a boot server eases switch deployment. ◦ Autonegotiation on all ports automatically selects half- or full-duplex transmission mode to optimize bandwidth. ◦ Automatic media-dependent interface crossover (MDIX) automatically adjusts transmit and receive pairs if an incorrect cable type (crossover or straight through) is installed. ◦ Cisco VLAN Trunking Protocol (VTP) Version 3 supports dynamic VLANs and dynamic trunk configuration across all switches. ◦ Switching database manager (SDM) templates, VLAN template (specific to LAN Base license level), and advanced template allow the administrator to automatically optimize the ternary content-addressable memory (TCAM) allocation to the desired features based on deployment-specific requirements. ◦ Stacking master configuration management with Cisco StackWise-160 technology helps make sure that all switches are automatically upgraded when the master switch receives a new software version. Automatic software version checking and updating help ensure that all stack members have the same software version. 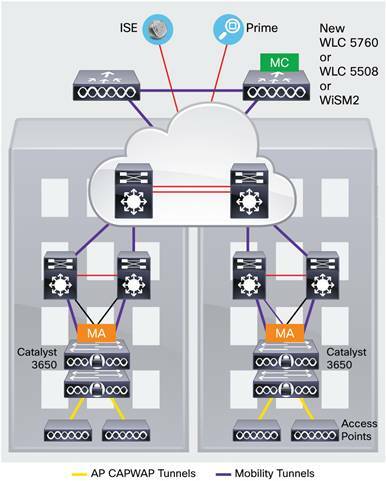 ◦ Optimized multicast for wired plus wireless: Cisco Catalyst 3650 offers greater multicast efficiency by receiving only one multicast stream and replicating it for all connected wired plus wireless devices connected to that switch. ◦ Internet Group Management Protocol (IGMP) v1, v2, v3 snooping for IPv4: multicast listener discovery (MLD) v1 and v2 snooping provides fast client joins and leaves of multicast streams and limits bandwidth-intensive video traffic to only the requestors. ◦ Wireless RF management provides both real-time and historical information about RF interference affecting network performance across controllers using systemwide Cisco CleanAir technology integration.